Jack Klatt Band. This month’s CenterStageMN. Harlem Quartet. New York-based Harlem Quartet, is praised for its “panache” by The New York Times and hailed in the Cincinnati Enquirer for “bringing a new attitude to classical music, one that is fresh, bracing and intelligent.” Critic Julian Haylock, reviewing a NAXOS recording of string quartets by Walter Piston, called Harlem Quartet a “formidable ensemble whose members play highly demanding scores with infectious vitality, breezy confidence and (most importantly) affectionate warmth.” Since its public debut at Carnegie Hall in 2006, the quartet has thrilled audiences in 47 states as well as in the U.K., France, Belgium, Brazil, Panama, Canada, Venezuela, and South Africa. $20. Ives Studio Theater. Reif Center. 720 Conifer Dr.
Mid-month Artist Talk. David Dobbs is Historic Central School Artist in Residence and Education Director for MacRostie Art Center. Free. MacRostie Art Center. 405 NW 1st Ave.
CenterStageMN. Jack Klatt Band. 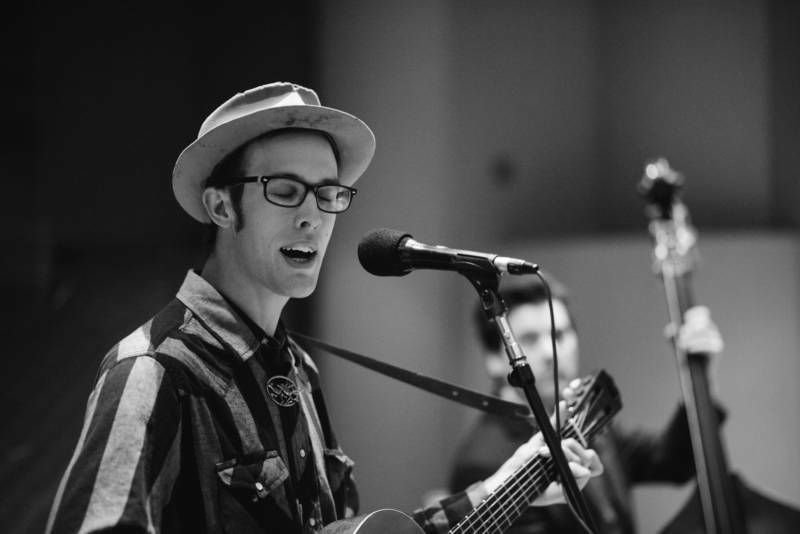 Part balladeer and part bluesman, Jack is a dedicated songwriter and finger-style guitarist based in Minneapolis, MN. His unique sound defies genre with influences that pull from a wide range of American music. From Rhythm and Blues and early Rock N’ Roll, to country and folk music, Jack brings his unique voice to all of his songs. In the words of Americana Roots UK “Jack doesn’t rely on other writers for his diversity, he can write in pretty much any musical style of his choosing.” $15. Ives Studio Theater. Reif Center. 720 Conifer Dr.
A Midsummer Night’s Dream. The Reif Theater Education Program, a joint project of The Reif and the Grand Rapids Players, will present an adaption of Shakespeare’s classic comedy. Students ages 6-12 grades will perform after attending six-weeks of theater training.This adaption preserves the original poetry while simplifying the language. The version is adapted by award-winning playwright Claudia Haas, a White Bear Lake, Minn native who has devoted more than 20 years to writing plays for youth and young performers. Adults $10. Students $5. Wilcox Theater. Reif Center. 720 Conifer Dr.
Shagawa Shorty. Klockow Brewery. 36 SE 10th St.